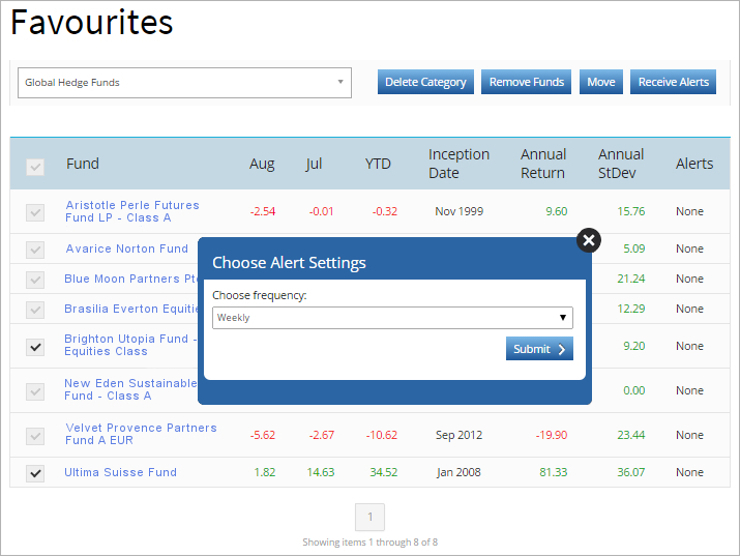 At Eurekahedge we are constantly creating new features for hedge fund analysis. Enhance your investment management strategies with the latest hedge fund performance measurement tools that provide several points of view; enabling you to see the most complete picture of the hedge fund industry, no matter how specialised the portfolio. Flag funds that you would like to track and set email notification alerts to be sent to you whenever the details of the fund is updated. This way you will never miss the latest movements in performance of hedge fund returns, assets under management, fees, or even style drift! Simple – you perform a search, you like the results, save it for later without the worry of trying to recall what search parameters you entered. Eurekahedge's advanced search is simple! 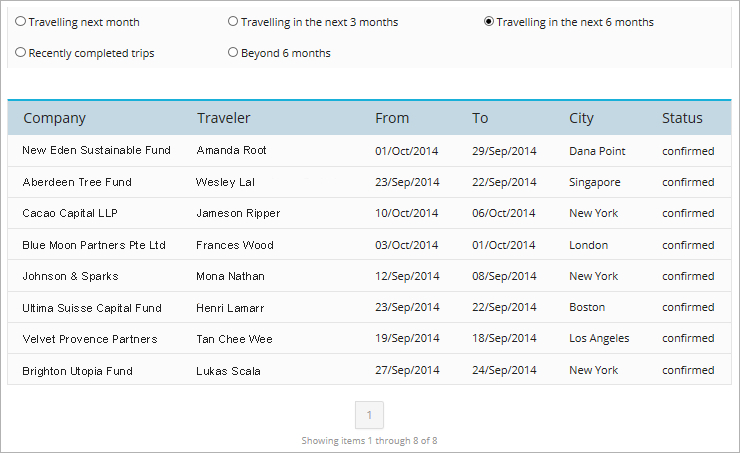 It allows you to search by every single data point and statistic we have for each fund. 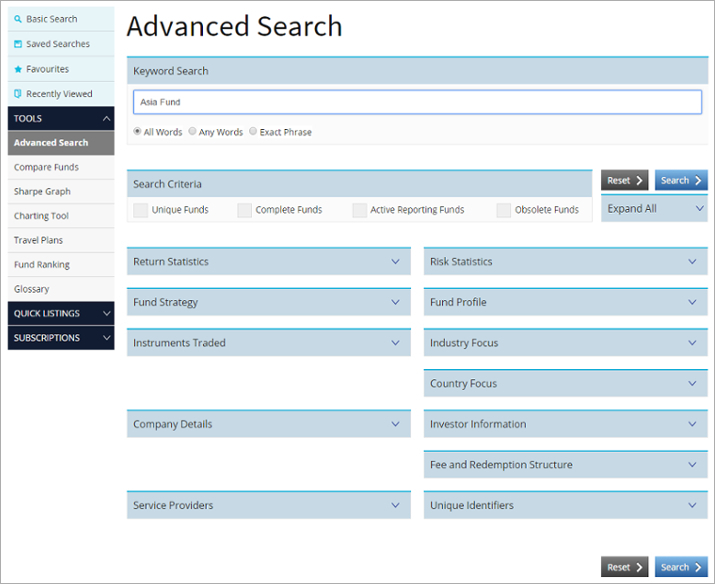 Efficient and user-friendly, the customisable output lets you generate specific results based on the databases’ over 100 search criteria that can be combined for a very powerful hedge fund screening tool. Over the years Eurekahedge has often identified Maddoff-esque funds that have later discovered to have been fraudulent by the financial media and their investors. On the flip side there are some truly outstanding managers with consistent absolute returns. 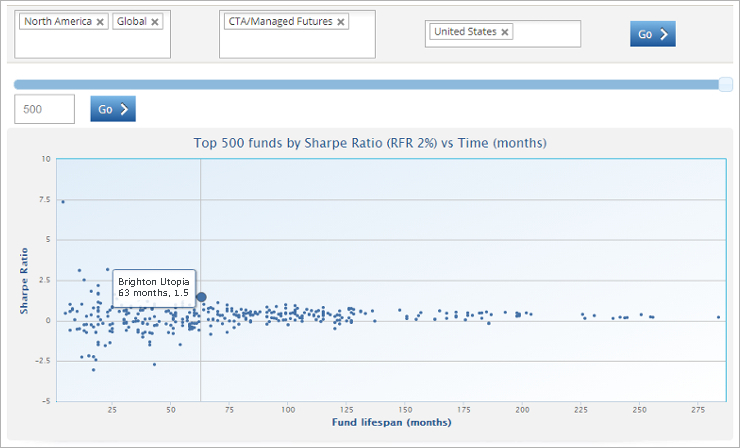 By tracking all funds across our databases, one of the easiest ways to pick out these extraordinary managers is to plot funds’ Sharpe ratios over time. This is a great feature for quickly categorising funds by using the three fundamental metrics of performance returns, volatility and time. 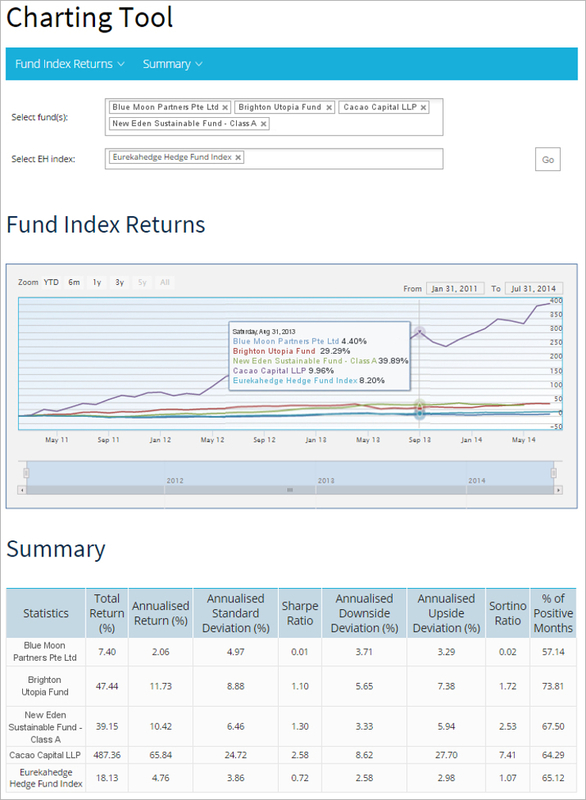 Great for comparing hedge fund benchmarks, Eurekahedge’s most powerful performance measurement tool allows users to chart and compare multiple funds and indices on the same graph. You can add as many funds and indices as you like, with fully adjustable time periods and a whole host of associated statistics over those time periods as output. Eurekahedge Travel Plans adds the personal element to investment management strategies. 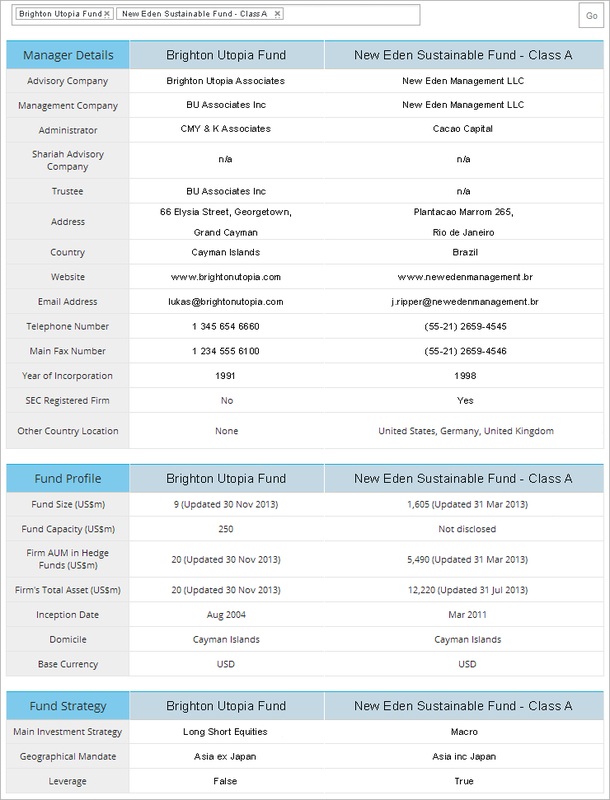 A display of upcoming business trips from hedge funds in the Eurekahedge database, investors are provided with the opportunity to meet fund managers from other regions face-to-face. The service can be adjusted to automatically email investors when fund managers are visiting their city. Some of the most common lists we have that you can access at a click of a button are your personal favourites, your recently viewed searches, your saved searches, obsolete funds and new listings in the database and hedge funds that have posted their latest performance returns. All designed to eliminate any repeat searching and screening to save you time. Straightforward but powerful, the top 10 tables analyse and rank the best funds by their latest returns, year–to-date returns, annualised returns, annualised standard deviation, Sharpe ratio, maximum drawdown, assets under management and the latest growth in assets for the previous month.